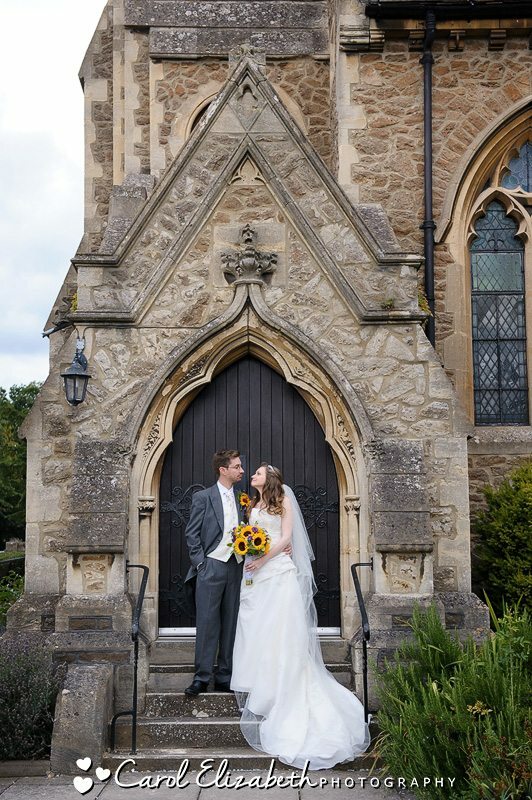 I met Lizzi and Tom again a few weeks ago for their pre-wedding photoshoot in Abingdon, and it was a real pleasure to see them again as they are such a lovely couple. 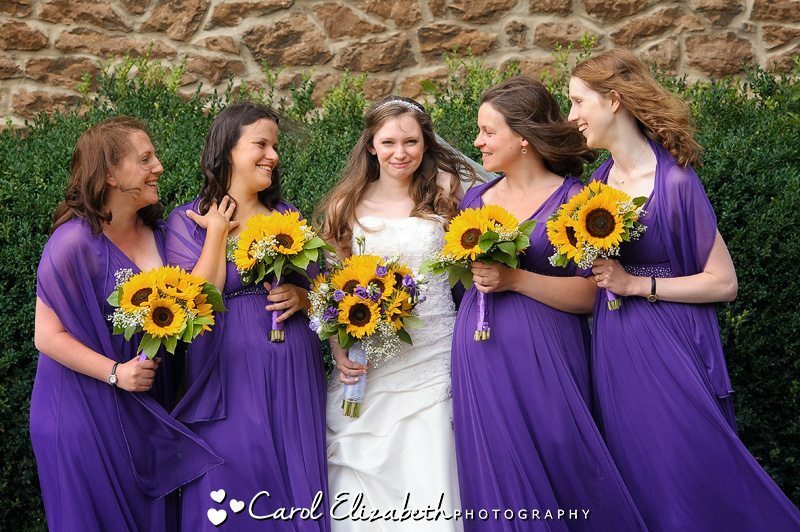 On the big day I met Lizzi and her bridesmaids for their preparations for the wedding at Four Pillars Hotel Abingdon where they had their hair and make-up done. 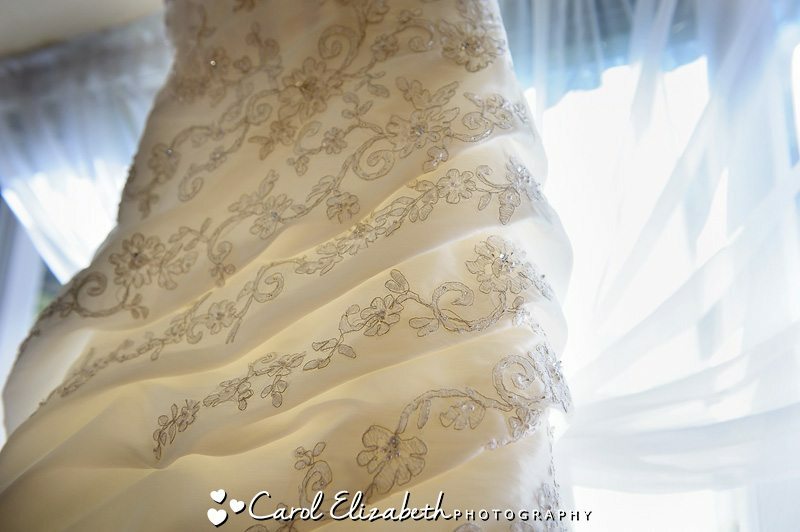 It was such a fun atmosphere with lots going on, and I was delighted to see Lizzi’s beautiful wedding dress hanging up. 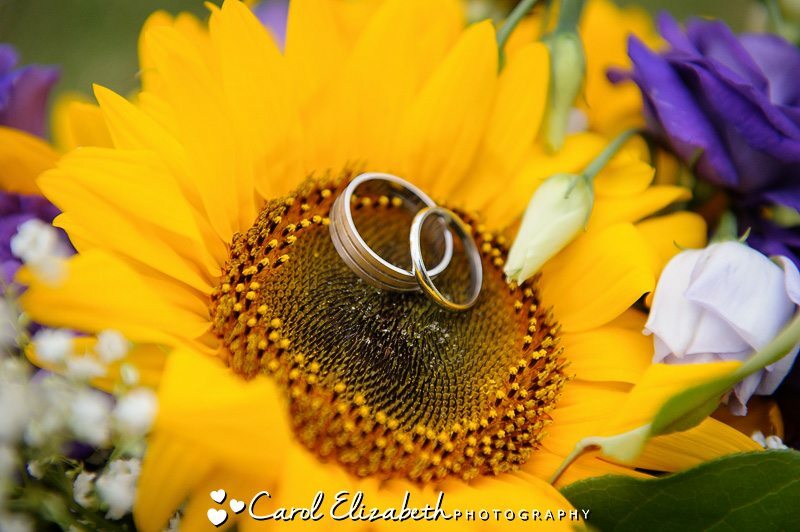 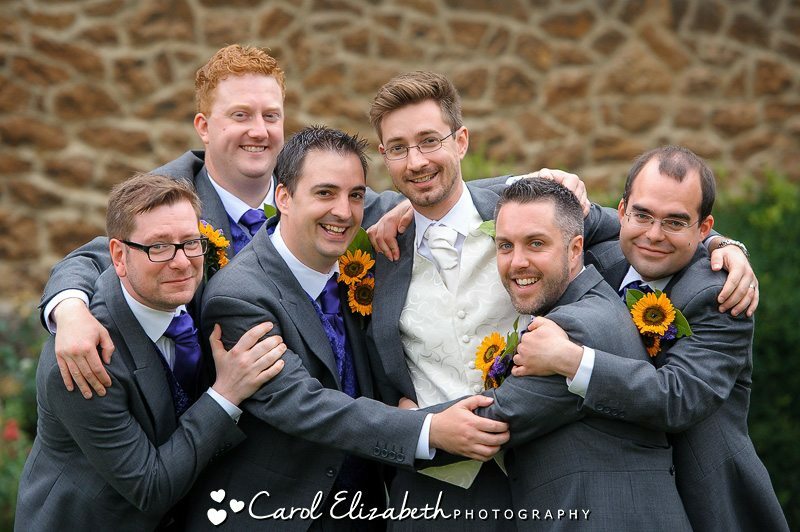 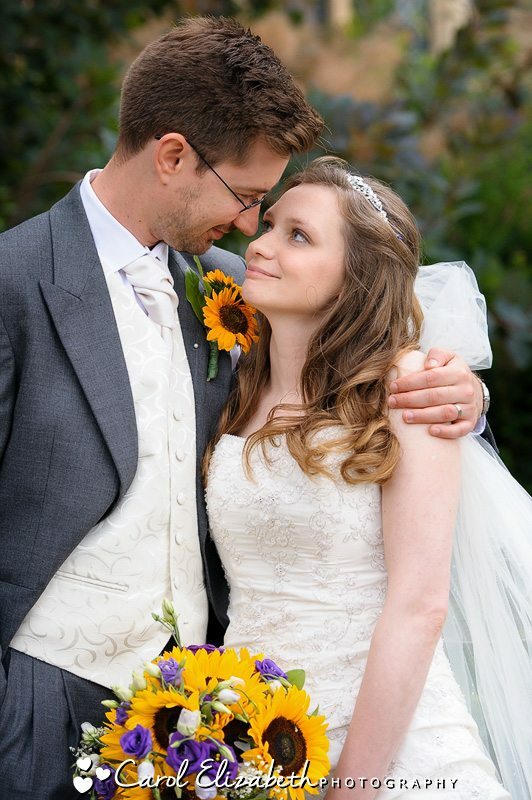 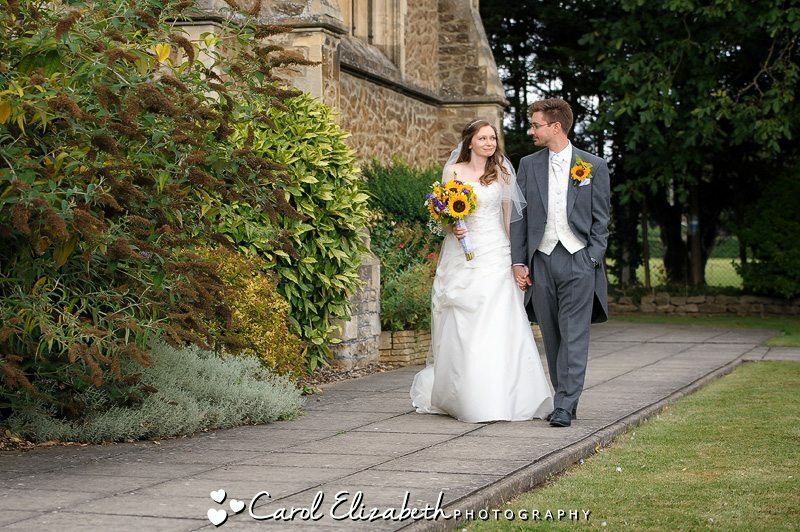 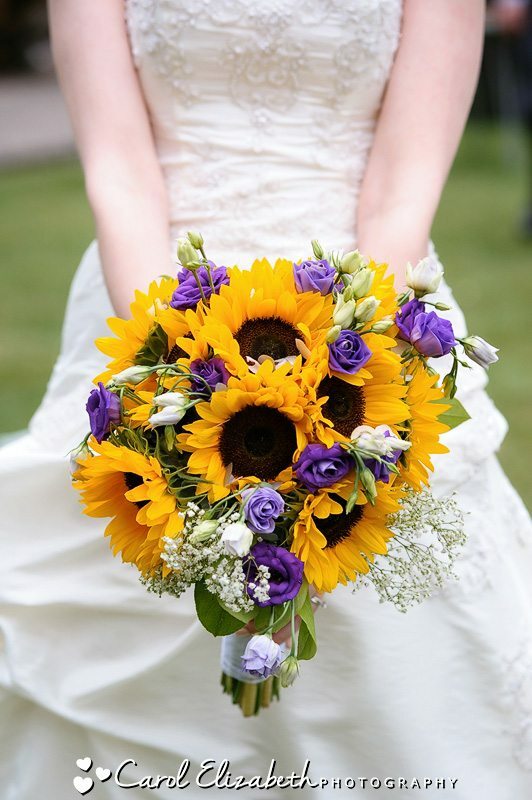 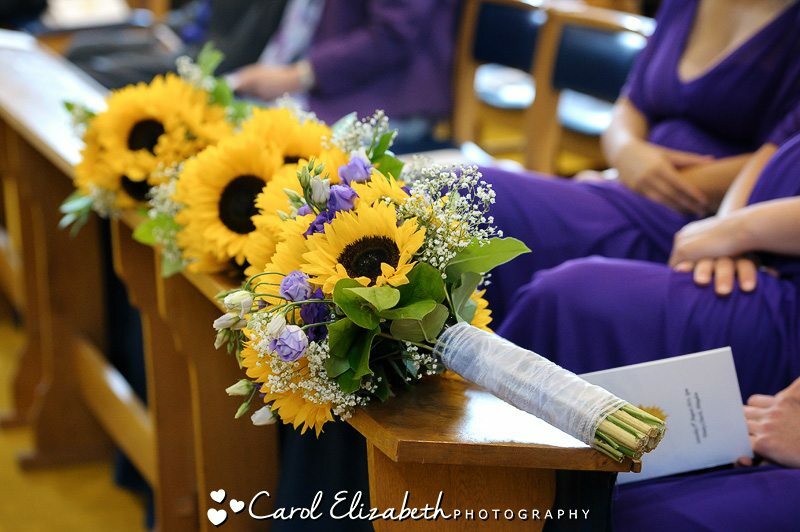 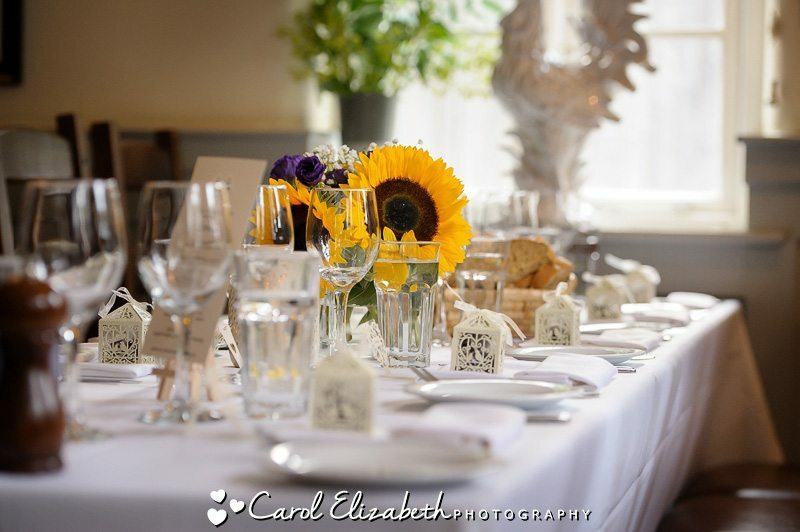 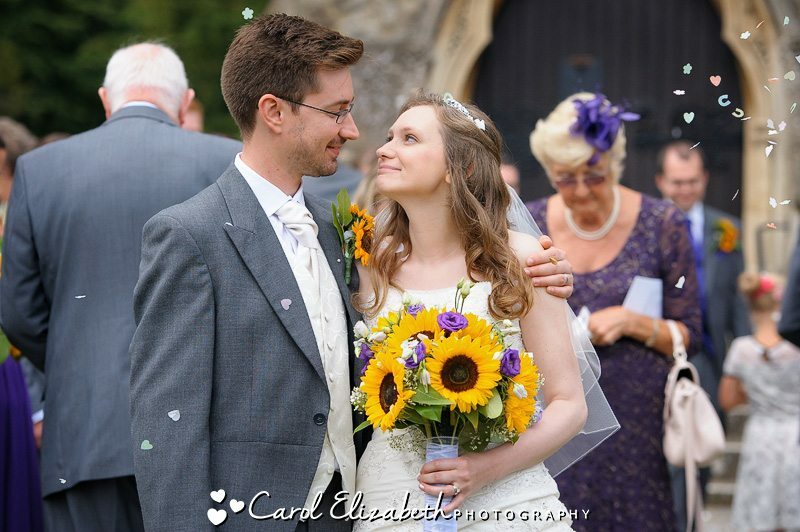 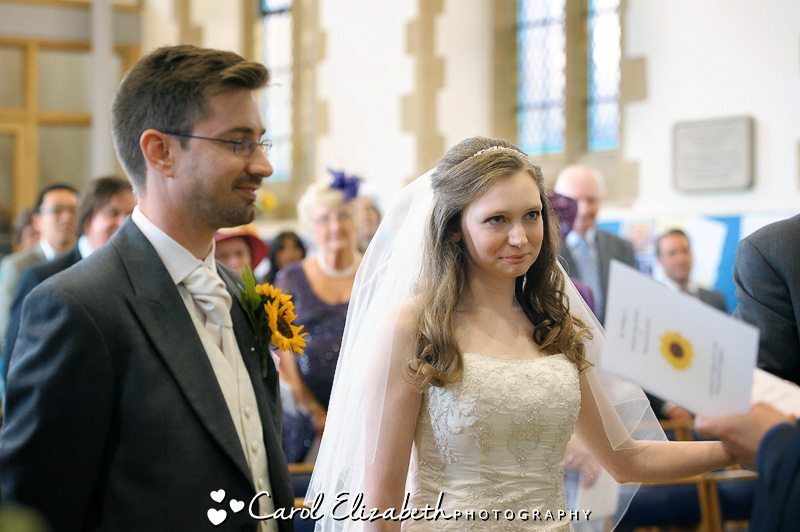 Lizzi had chosen sunflowers for her wedding which are really one of my favourite wedding flowers as they look amazing in the photographs. 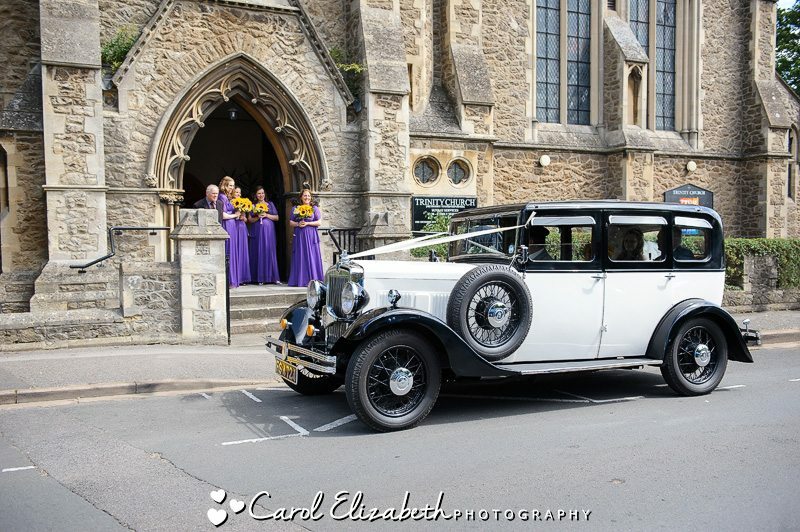 We were soon on our way to the wedding ceremony at Trinity Church in Abingdon. 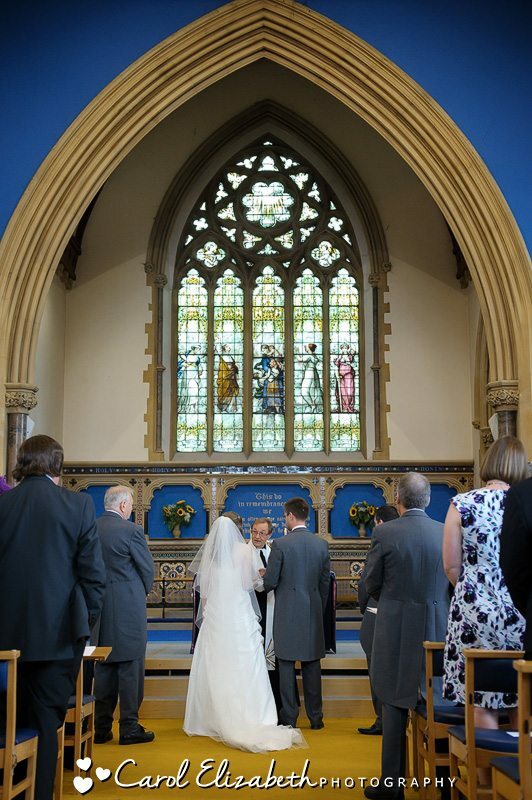 Its a beautiful church with plenty of beautiful features. 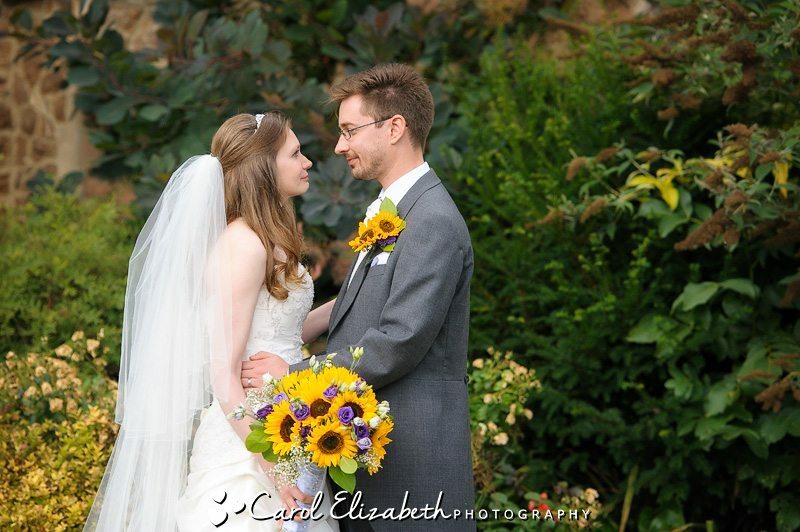 Lizzi looked stunning walking down the aisle, and the ceremony was very moving. 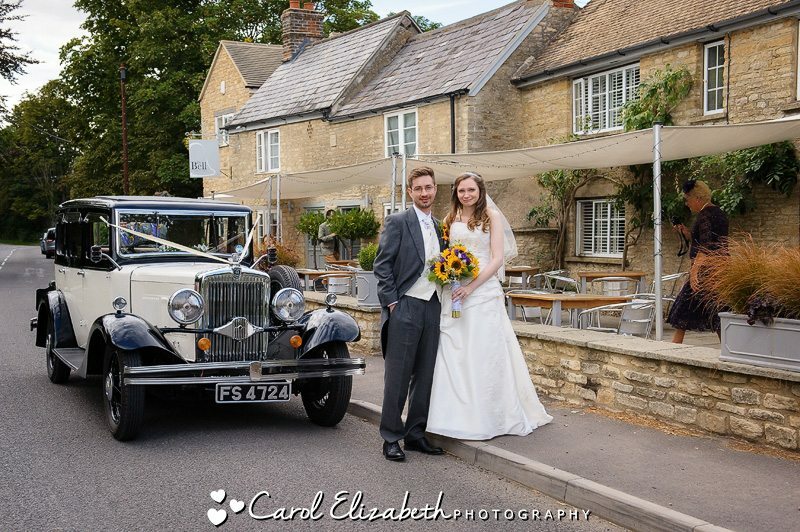 We were lucky to have beautiful sunshine for the guests to enjoy their drinks on the lawn whilst the group photographs were taken. 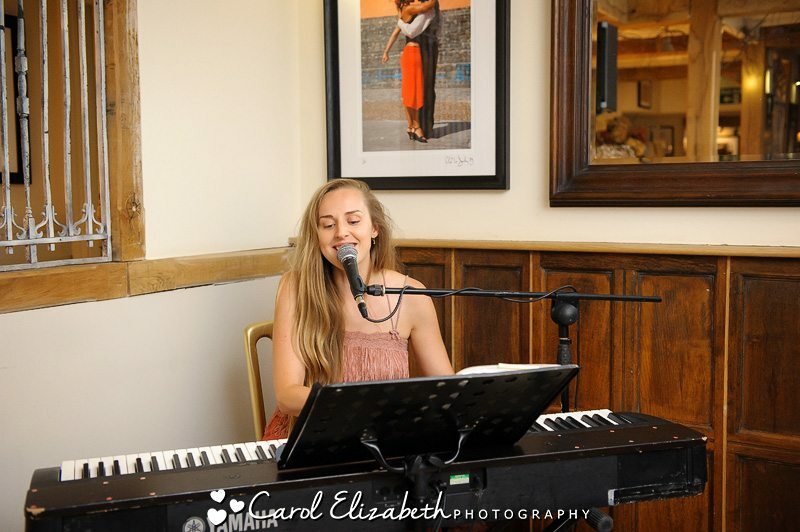 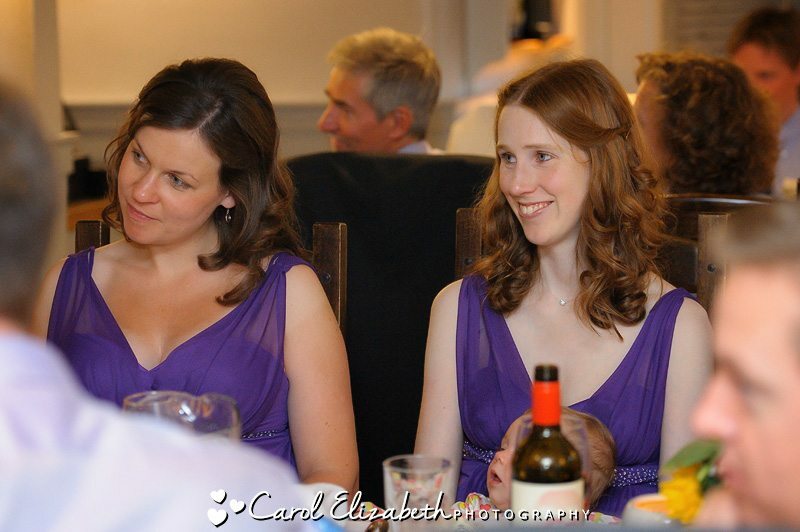 It was a very relaxed atmosphere and everyone had a great time. 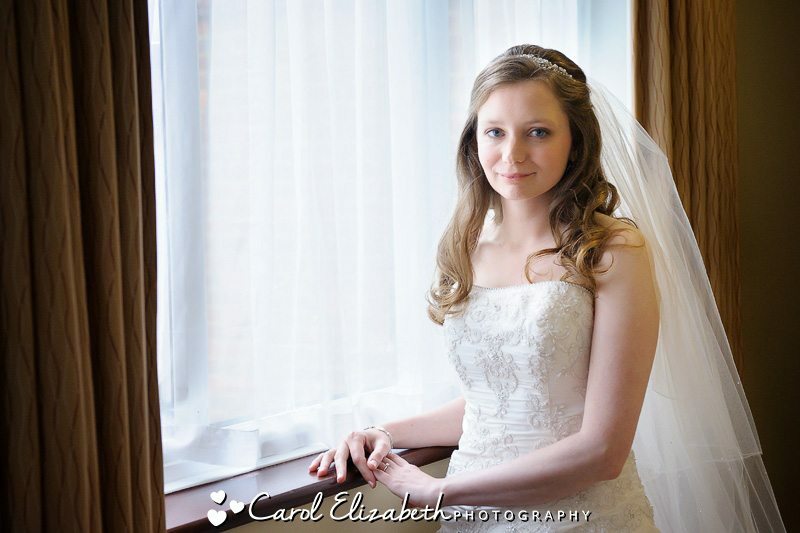 We then enjoyed a few minutes capturing some bridal portraits before heading off to The Bell at Hampton Poyle wedding reception. 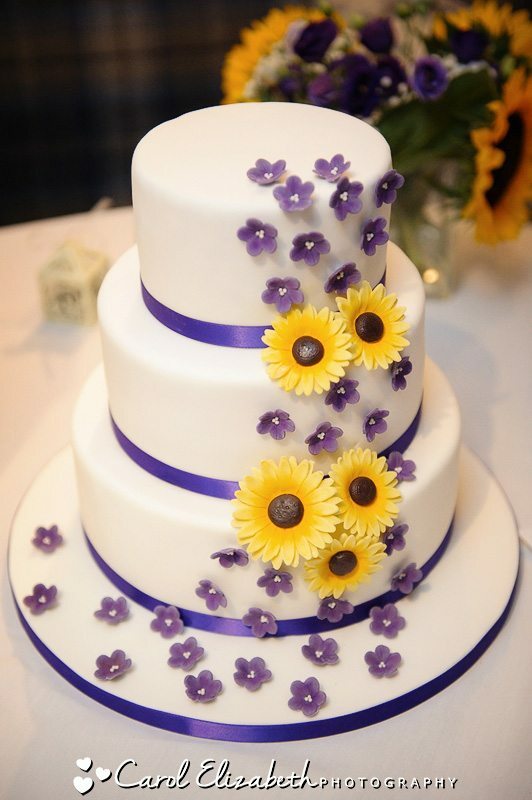 After the speeches it was time for cutting of the cake – a beautiful cake adorned with purple and yellow flowers. 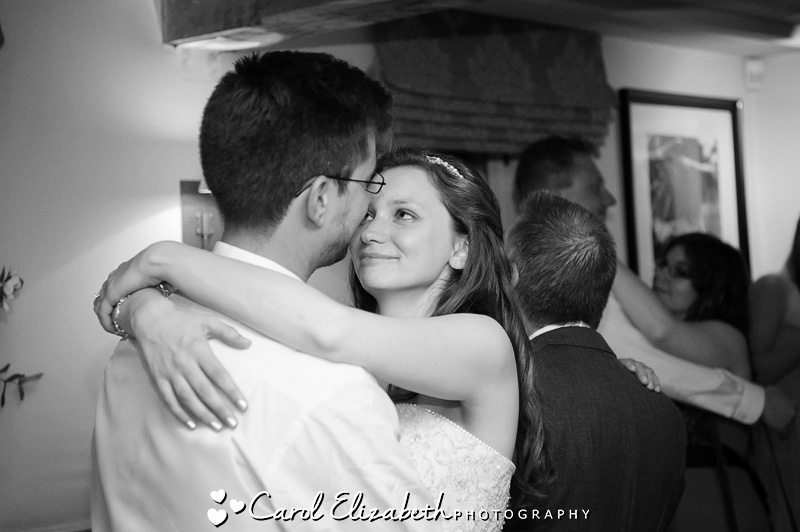 Then time for dancing and the evening festivities. 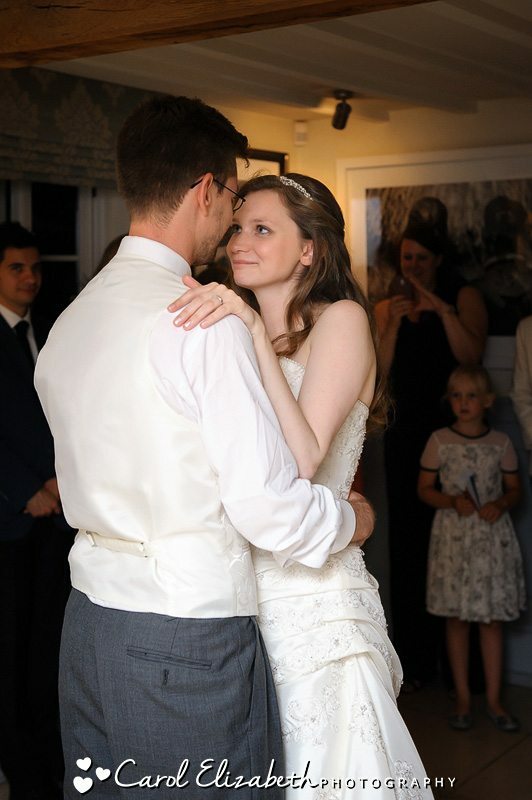 All in all, a perfect day. 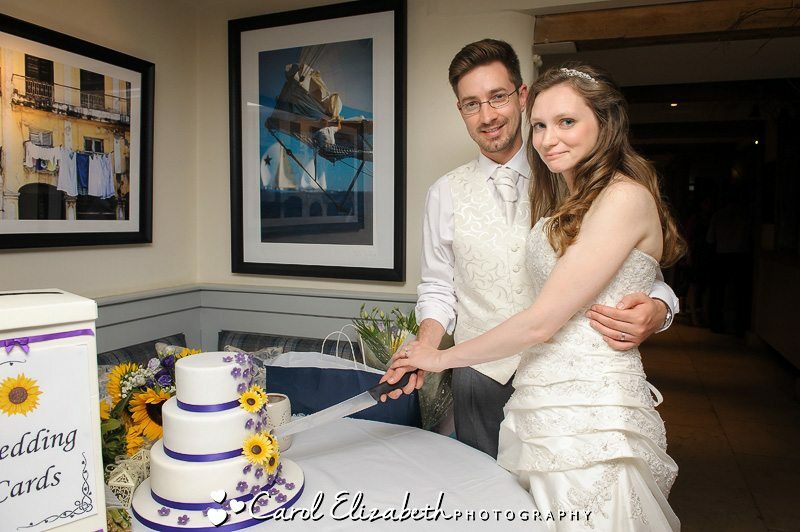 Congratulations Lizzi and Tom, wishing you all the best for your future together. 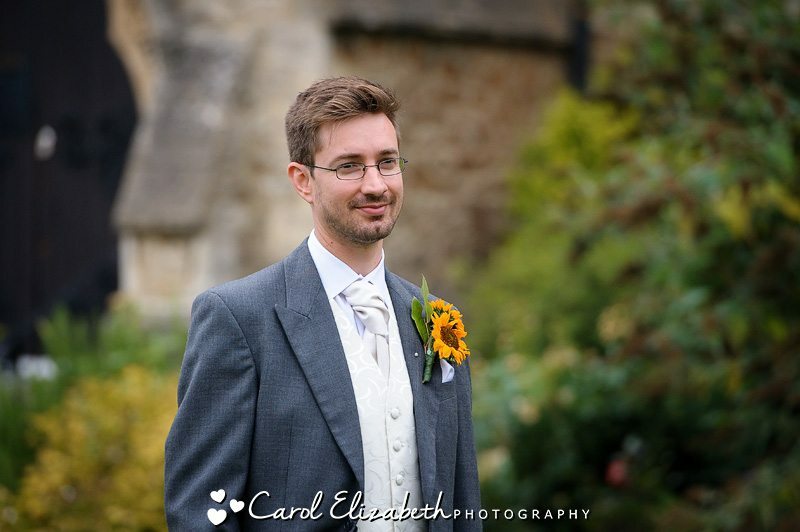 If you are looking for a classic wedding photographer in Oxfordshire then please get in touch for a chat about your big day. 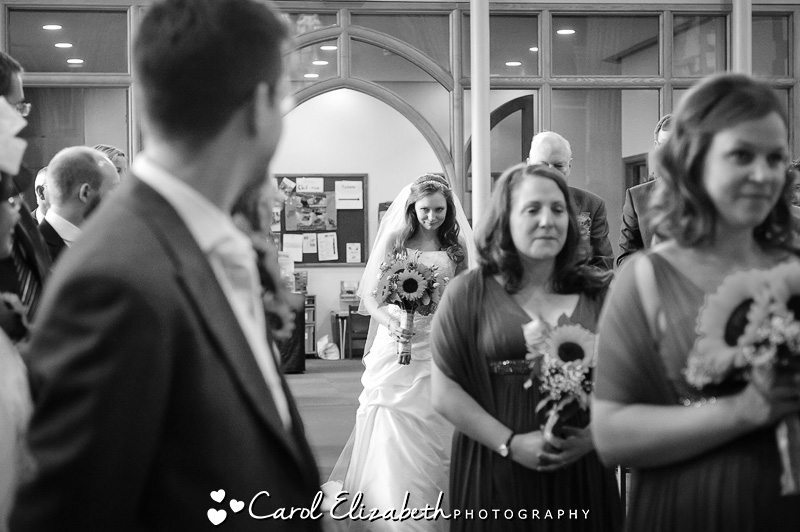 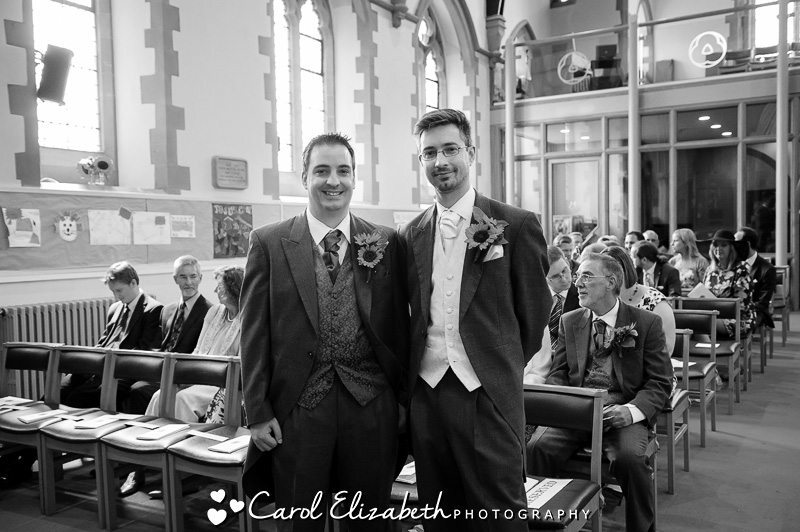 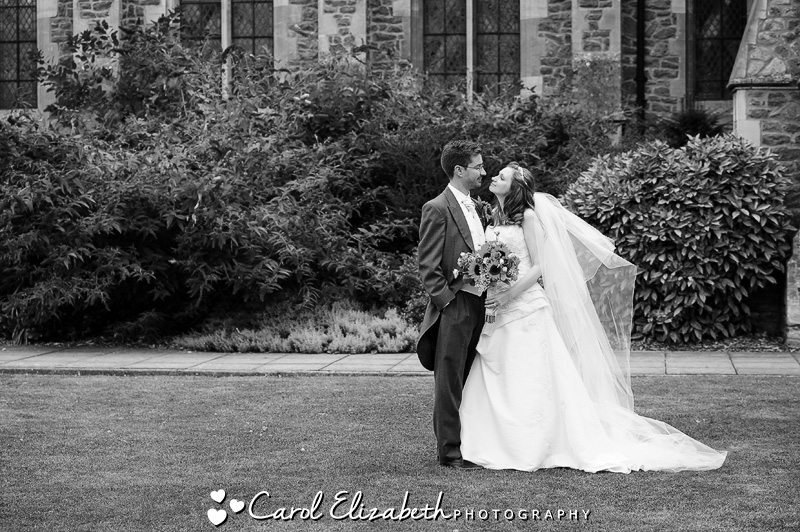 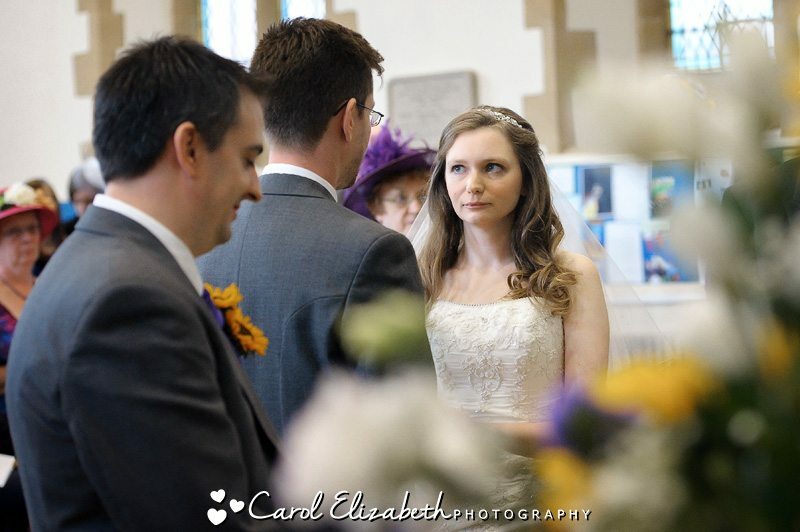 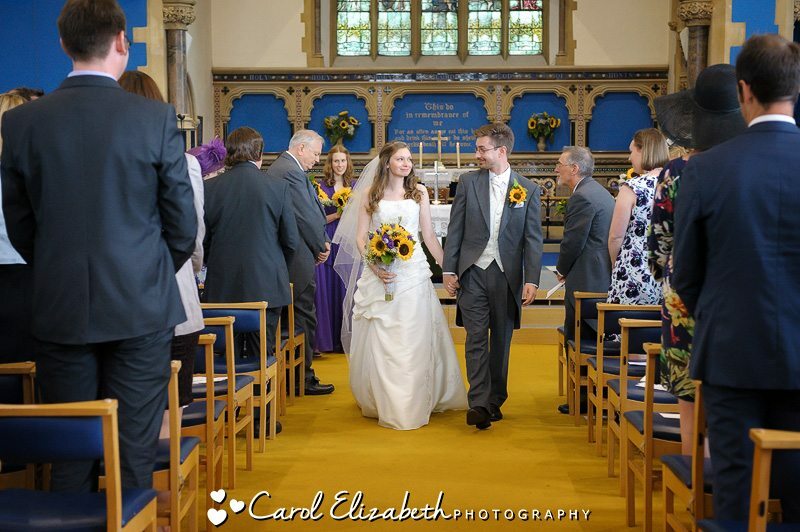 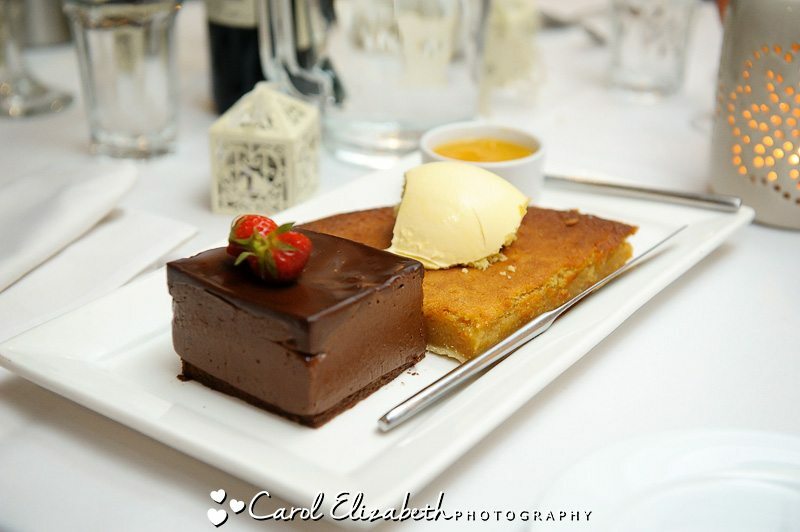 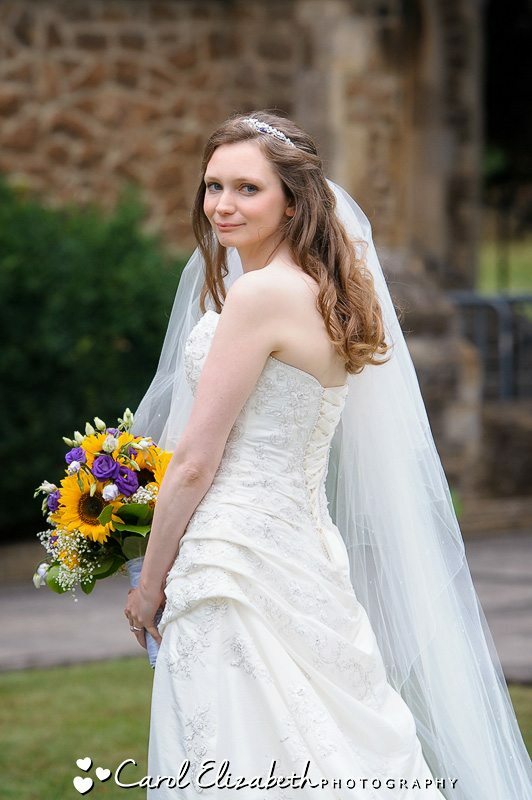 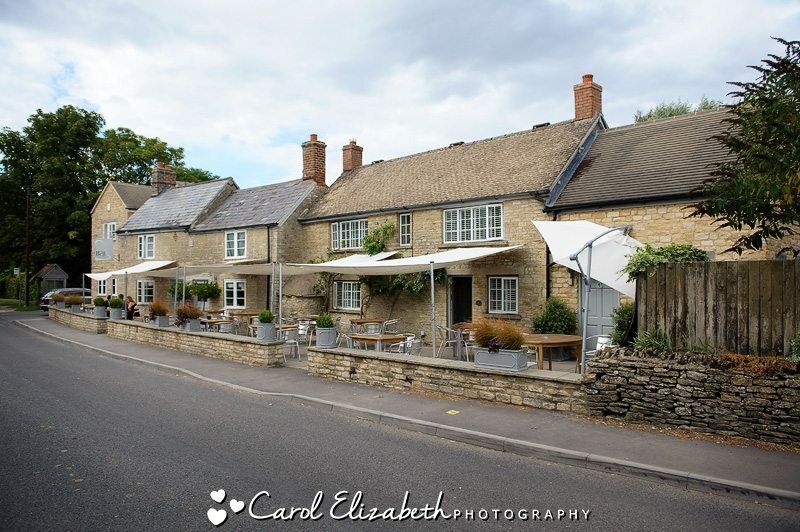 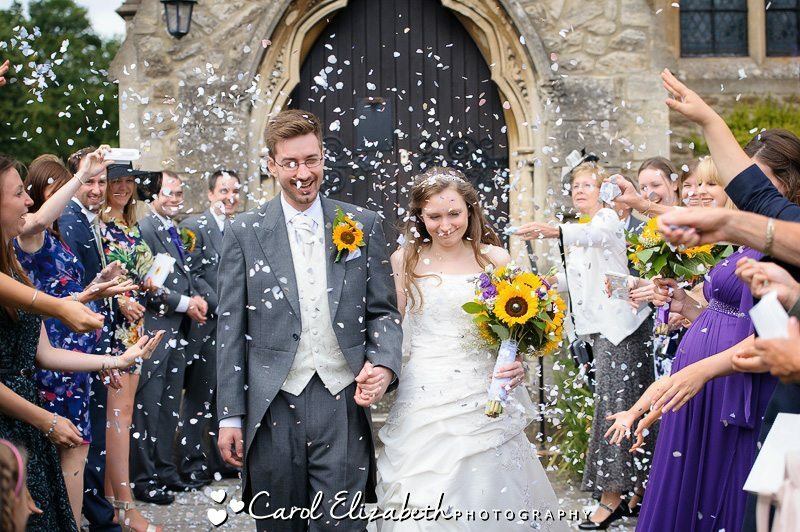 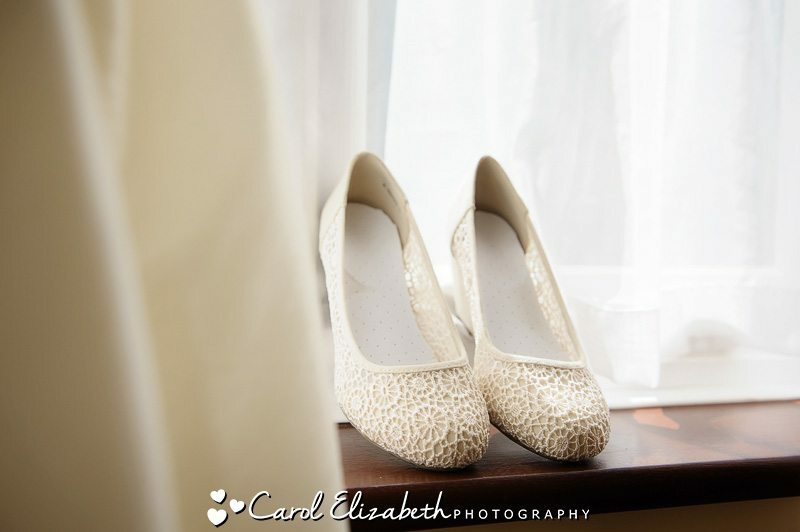 I am a wedding photographer in Abingdon and I photograph weddings across our beautiful county.